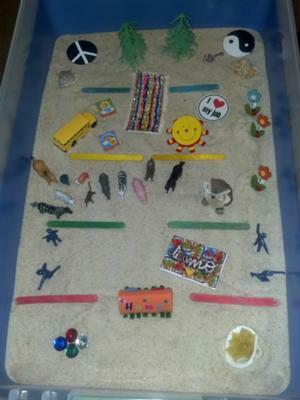 The hierarchy of needs extended sand tray for sand tray therapy class was different from the previous sand trays because I spent multiple days thinking of what I might want to place in the sand tray and what I might be missing. In the end, I followed my instincts included the things that inspired me most. This experience allowed me to be thankful for the life I am living. I have encountered throughout my career and how these children were lacking the safety and physiological needs that I have always taken for granted. Sometimes you get so involved in your own life and its relative struggles that you don’t stop to think about how fortunate you are in so many ways. 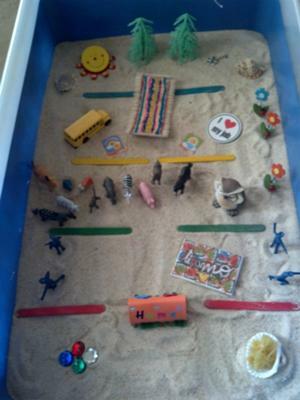 I did not have many miniatures to place in the physiological needs section of my sand tray so I had to get creative. I included pasta to represent nourishment and then I added gems to represent money. I added a water hole on the last day and although the house started in this section, I ended up moving it to the middle between the physiological needs and the safety needs because I thought it belonged in both. The safety section had few miniatures and it remained the same throughout the week. The “ti amo” magnet represented my boyfriend who makes me feel safe. I also added the soldiers because they reminded me of my childhood. I grew up in or around military bases because my father was in the Navy. Therefore, I always had a sense of safety. 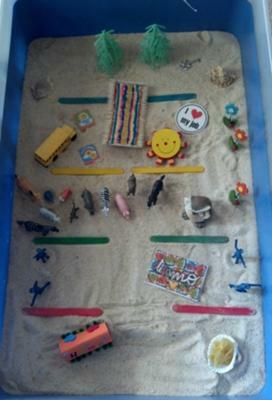 The love and belonging section of my sand tray was quite crowded and also remained the same from beginning to end. I chose to add a diversity of animals to represent the many important people in my life. The horses represented my family and the owl represented my boyfriend. I currently have and have always had a great support system of individuals that have made me feel loved and included. The self-esteem section of my sand tray also remained basically the same throughout the week. I moved the sun from the self-actualization section to this section because I just thought it belonged here more. In this section, I was thinking about my education, represented by the school bus, and my career, represented by the magnet. I also placed motivational stickers in the tray because I tend to motivate myself but I also like to hear encouragement from others. This section also included a sand tray therapy bridge leading to the next section. I was thinking that when I feel good about myself, I also tend to feel more fulfilled so the two areas are somewhat related. I have always been proud of my achievements in school and am now proud of the career I am creating for myself, even though I am not making the big bucks! 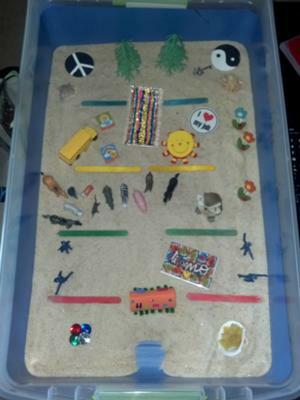 The final section of the sand tray for sand tray therapy was all about self-actualization. The first miniatures I placed in this section were the trees. I was thinking of the deep roots that trees possess and how they grow through the seasons and stand tall despite life’s challenges. I also placed a key in the section because I felt it belonged. I feel that I possess the key to my life and that I am in control of what happens to me. I can choose to live the life I love. I also chose to add a peace sign and a ying yang symbol towards the end of the week. I was trying to figure out a way to represent my beliefs and settled on creating symbols. For me, the ying yang represents a balance that I strive to achieve in many aspects of my life. The peace sign was also meaningful to me because I try to live as peaceful a life as I can. Lastly, the sea shells were placed in this section because they wanted to be there. Even though I separated each of the sections of my hierarchy with popsicle sticks, I also made a point to leave space between them to give the sand tray therapy a more fluid feel. I enjoyed making this one!